When I say first, I mean, firstly, the jumper I designed and knitted after I (re)learnt to knit, and secondly, the only garment I’ve ever felted. It was made in Rowan Big Wool, of four rectangles (front, back, two sleeves) and I loved it. And then, five months ago, I washed it in the washing machine. On a wool cycle. Because I didn’t know I shouldn’t. And it felted. Being a bit of a hoarder, I couldn’t bear to throw my new miniature jumper away. I wanted to upcycle it. And this week I did. 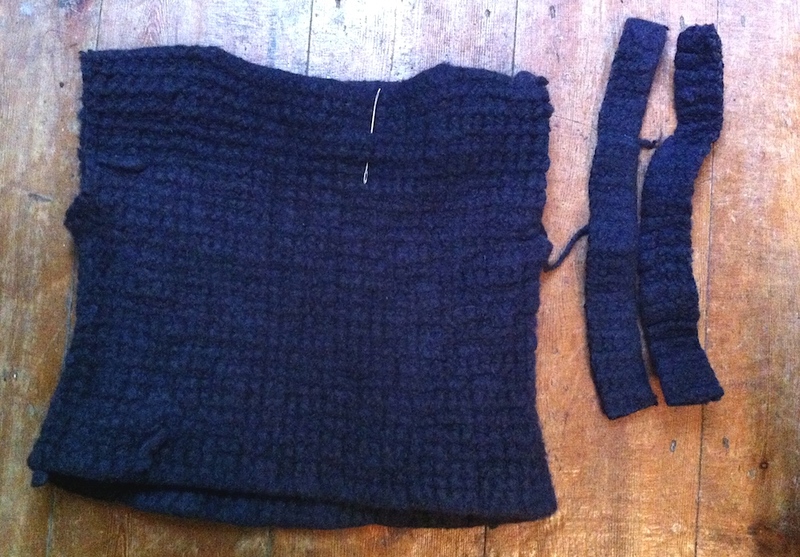 I cut the sleeves off, sewed the front and back together where necessary, cut two strips – and made a bag. It’s lovely. I’ve had compliments. But I’d still prefer the jumper. 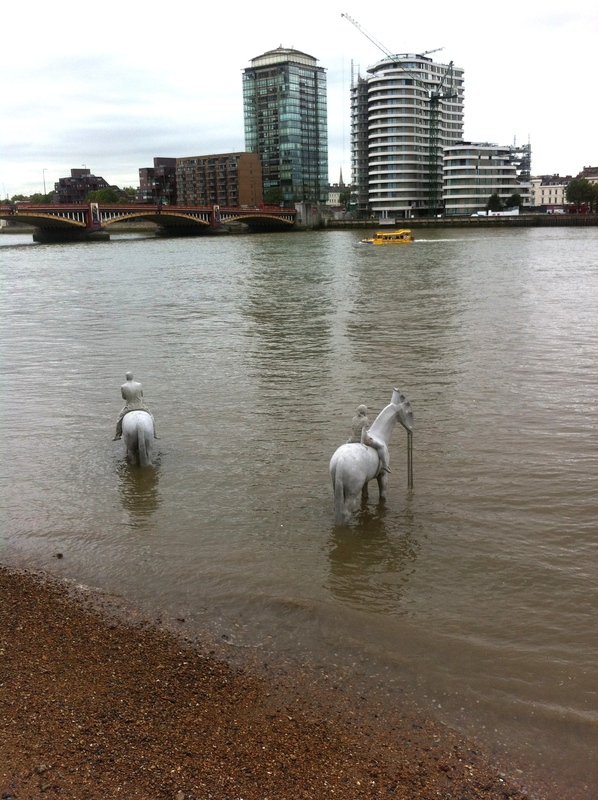 Part of the annual Thames Festival, this sometimes-submerged sculpture by Jason Decaires Taylor, is on the south side of the Thames by Vauxhall Bridge, next to the MI6 building. It’s designed to encourage environmental awareness and features four horses with nodding donkey oil drills for heads. Men in suits sit astride two of the horses, looking upward, avoiding looking at the rising water. Children sit astride the other two, and their gaze is directed at the river. The sculpture is in situ until September 30. That’s the one that vegetarians like me worry about. It’s found in meat, eggs and dairy produce, and is needed for the production of healthy red blood cells to carry oxygen around the body. Symptoms of deficiency include extreme tiredness and lack of energy. I’m certainly not lacking in energy at the moment, but as always it’s hard to know what’s responsible – I’ve had a few positive changes in my life recently. There are lots of vitamin B12 supplements out there, but if you take daily supplements in tablet form, as I do, you might like Better You Boost B12 Oral Spray (£11.95). If you’re necking a succession of capsules it’s a pleasant change to squirt this deliciously peachy-tasting supplement inside your cheek, where it’s more easily absorbed by the body than via the stomach. This product was supplied for testing free of charge. I’ve been making elderflower ‘champagne’ for several years, and I haven’t even finished this year’s ‘vintage’ when with the sudden arrival of autumn (which felt like it happened overnight) the elder trees were covered with sprigs of black berries. Elderberry, or Sambucus nigra, concoctions have been a folk remedy for colds for donkeys’ years, and there are several cold-fighting products on sale that contain it. However, I’m content to take my homemade cordial with hot water if I’m struck down by the virus. And in the meantime, it makes a very acceptable alternative to crème de cassis for a kir. Pick some berries (by cutting the sprigs off the tree, not individually), then run a fork down the stems to remove the berries. Give them a rinse, drain, weigh them, put them in a saucepan and just cover with water. Add half their weight in sugar, bring to the boil and stir until the sugar dissolves. Then pour the cordial into sterilised bottles. Until this week, my earrings have been jumbled up together in a lidded box from Habitat. Not very satisfactory – it leads to endless rummaging, usually when I’m in a hurry. This week, inspiration struck… so I bought a canvas from Tiger (£3), and poked my earrings through it. You could also use it for necklaces, suspending them on a couple of pins poked through the canvas. 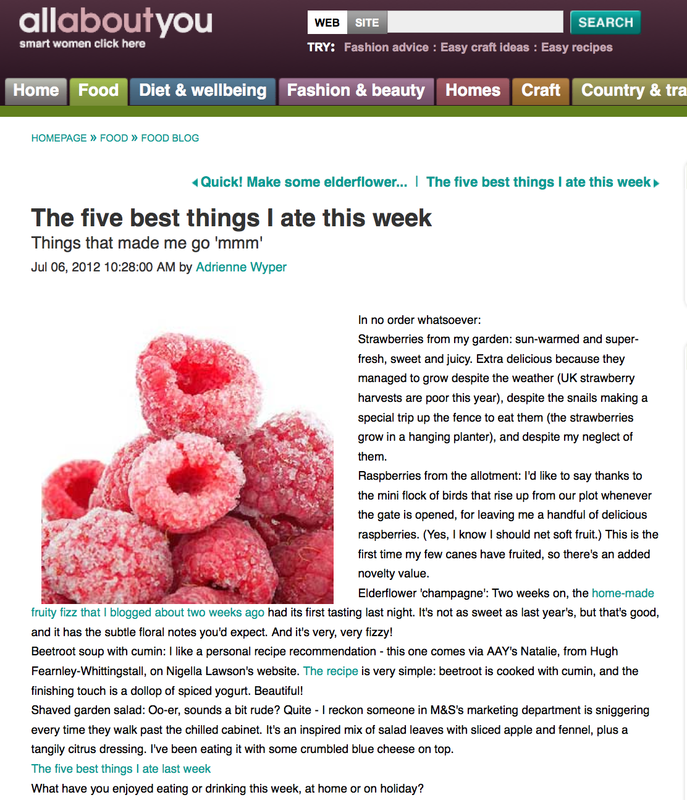 ‘The five best…’ was a long-running blog theme of mine on Allaboutyou.com. Here’s one from this day, two years ago.